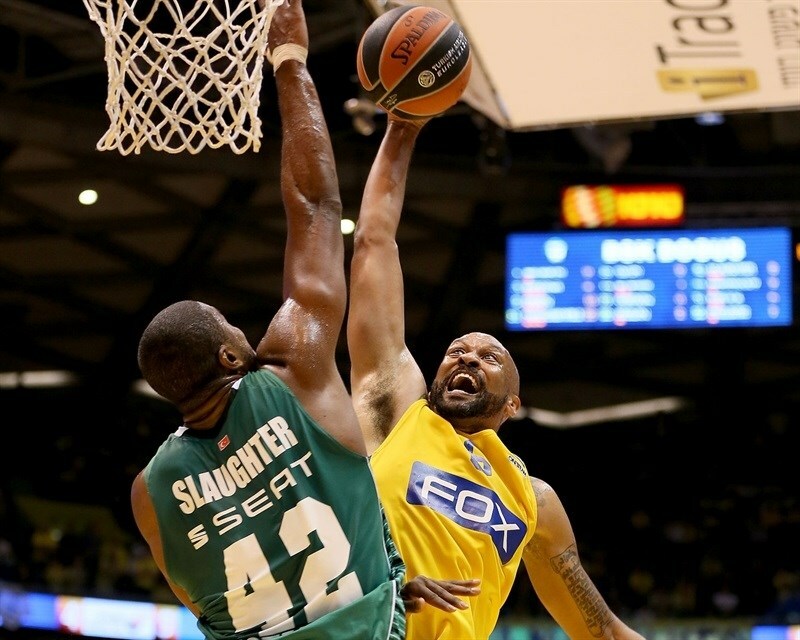 Darussafaka Dogus Istanbul made history with its first ever road win in the Turkish Airlines Euroleague and it came at Maccabi FOX Tel Aviv’s expense, 73-84, at Menora Mivtachim Arena. 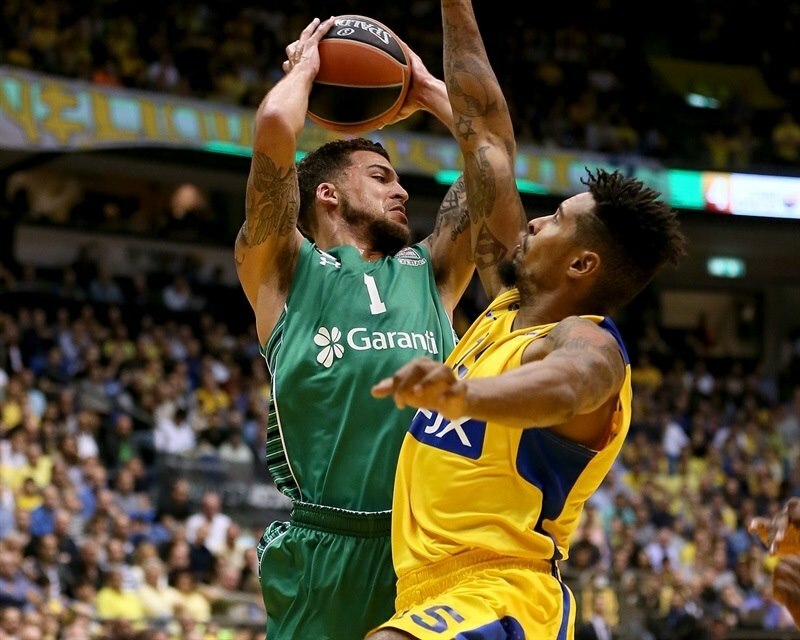 Manu Markoishvili scored 11 third-quarter points as the visitors took control and added a pair of threes early in the fourth as the lead grew to 15 and Maccabi never got closer than 8 the rest of the way. The result boosts Darussafaka to 2-3 at the midway point in Group D, while Maccabi fell to 1-4 for its worst start to a Euroleague season since the turn of the century. Markoishvili finished with 22 points, Semih Erden did not miss from the field in scoring 16 and Milko Bjelica added 11 points and 8 rebounds. The visitors made 25 of 33 two-point shots (75.8%). Maccabi, playing its first game under interim coach Avi Even, got 17 points from Taylor Rochestie, 14 from Devin Smith and 10 each from Jordan Farmar and Brian Randle. Maccabi won the opening tip and struck first on Randle’s mid-range jumper. A Markoishvili jumper got Darussafaka on the scoreboard. Reggie Redding ran the pick-and-roll with Erden, which resulted in a slam for the latter and Darussafaka’s first lead. Smith’s hook shot tied it, but Erden dunked on the ensuing play. Rochestie dished to a cutting Arinze Onuaku to even the game at 6-6. Markoishvili stole the ball from Rochestie and Yogev Ohayon was whistled for an unsportsmanlike foul when trying to stop him. The possession turned into 1 Markoshvili free throw and another basket in the paint for Erden. Ohayon’s 2 free throws were matched by Erden with a low-post move that made it 8-11 midway through the quarter. Jamon Gordon jumped over his defenders and found Erden under the basket for a slam and his 10th point. Rochestie sank a baseline jumper, but Erden’s confidence only grew as he drove to the rim for a layup. However a pair of Smith jumpers brought Maccabi back within 1. Rochestie nailed a triple to cap a 7-0 run that put Maccabi ahead. Luke Harangody for the visitors and Farmar for the hosts hit threes before Scottie Wilbekin drove and banked in a floater that tied that game at 20-20 after 10 minutes. Farmar impressed with a drive and dish to Vitor Faverani, but Emir Preldzic’s finger roll kept the teams even. 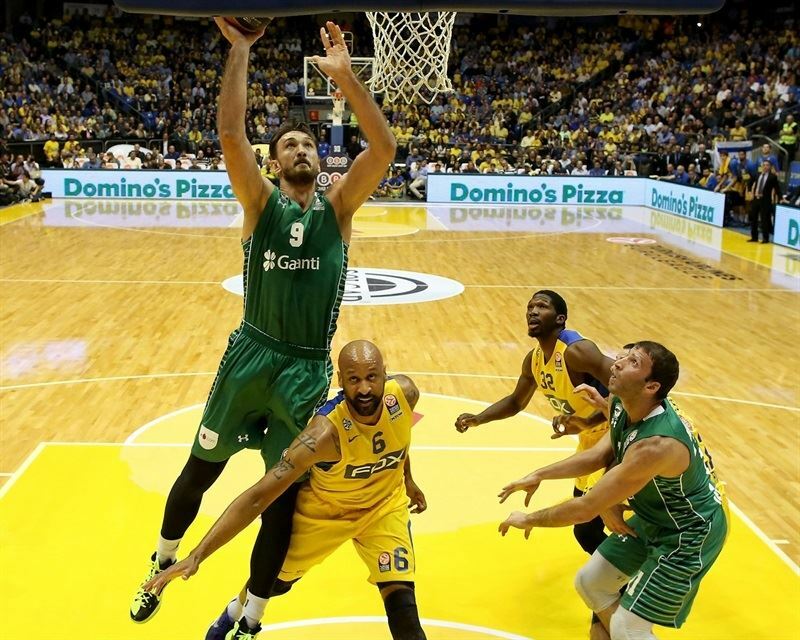 Furkan Aldemir marked his Euroleague return with a put-back for Darussafaka, but Farmar drilled a second-chance three at the other end. Preldzic stole the ball from Sylven Landesberg and Wilbekin finished the fast break with a layup that gave the visitors a 25-26 lead. Ike Ofoegbu tied the game from the foul line. After Harangody beat the 24-second clock with a jumper, Randle and Landesberg each split free throws. Ender Arslan’s long jumper made it 28-30 mid-way through the quarter. Landesberg scored at the rim to even things once more. Farmar made a great backdoor pass to Randle for a layup and foul. 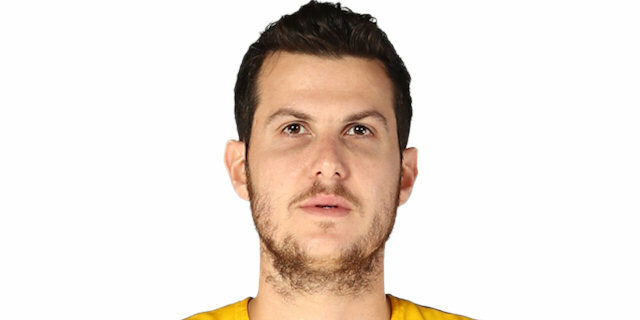 Farmar and Landesberg combined to steal the ball from Ender Arslan, which turned into a Farmar layup. Erden rescued the visitors, but another Farmar steal found Randle open for a dunk and a 37-32 advantage. After a Darussafaka timeout, Gordon scored for the visitors, but Onuake’s offensive rebound, basket and foul thrilled the crowd. Harangody buried a three at the top of the key and Marcus Slaughter rose to reject Rochestie in the closing seconds of the half to leave 39-37 on the board at the break. Onuaku split free throws on Maccabi’s first possessions of the second half, but a long three by Wilbekin tied the score. Rochestie matched him with a triple. Gordon found Milko Bjelica cutting for a slam off an inbounds play. 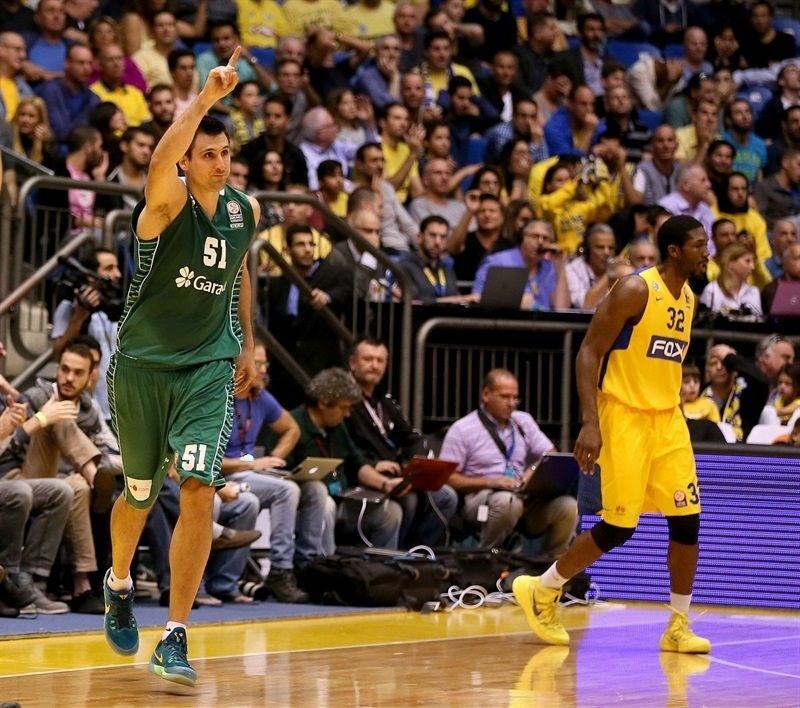 Then Gordon’s layup gave Darussafaka a 43-44 edge. Rochestie assisted Faverani for a layup, but the same player fouled Erden at the other end. Erden split free throws to tie it again. Randle drove for a tough layup and Markoishvili drilled a jumper with his foot on the three-point line. Despite a timeout, Markoishvili heated up with a triple and a foul draw on the break; he split free throws, Erden grabbed the miss, was fouled and split the resulting shots. Markoishvili’s put-back gave the visitors a 47-54 advantage. Ohayon connected from downtown at the other end. 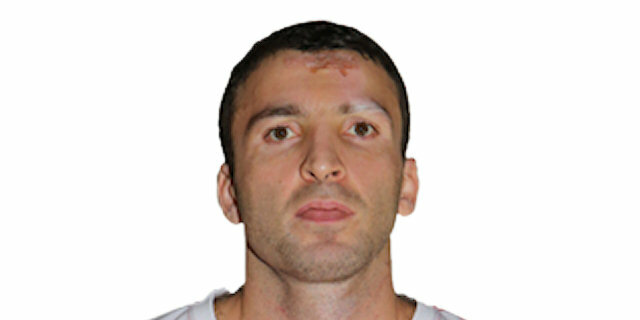 However Markoishvili continued to dominate with a free throw and then a layup after a give-and-go with Slaughter. Ohayon went coast-to-coast for a three-point play as the crowd was re-energized. Bjelica split free throws and Wilbekin made a tough shot with 5 seconds left for a 53-60 cushion. 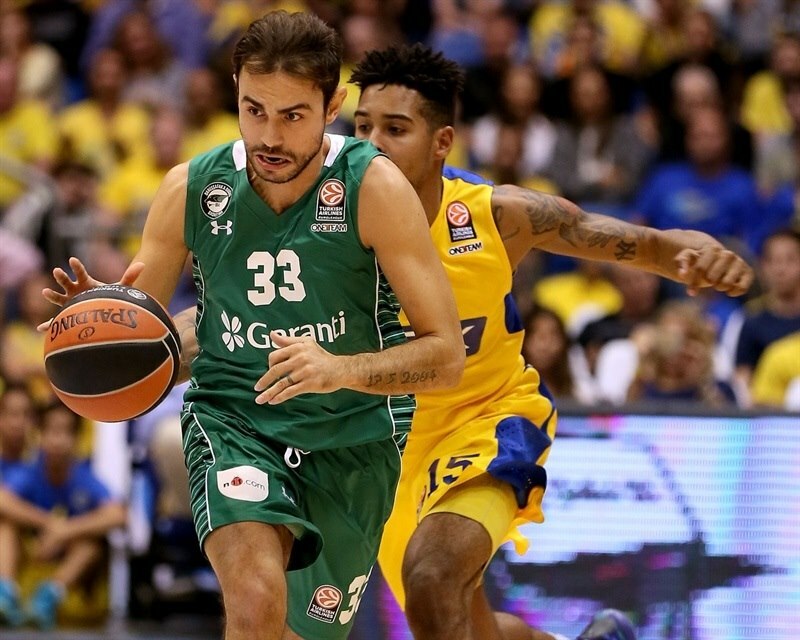 A Markoishvili triple gave Darussafaka the game’s first double-digit margin. Slaughter rejected Onuaku at the rim and Markoishvili connected from downtown for the third time. After another Maccabi turnover and a timeout, Redding’s fadeaway jumper capped a 0-9 Darussafaka run for a 15-point lead. Rochestie made a wild three and Smith hit a jumper to make it 58-68. Randle and Wilbekin were both helped off the court after a broken play. Rochestie added a jumper in the lane. Bjelica drained a long three, but Smith answered with a jumper. Redding made it 62-73 with free throws. 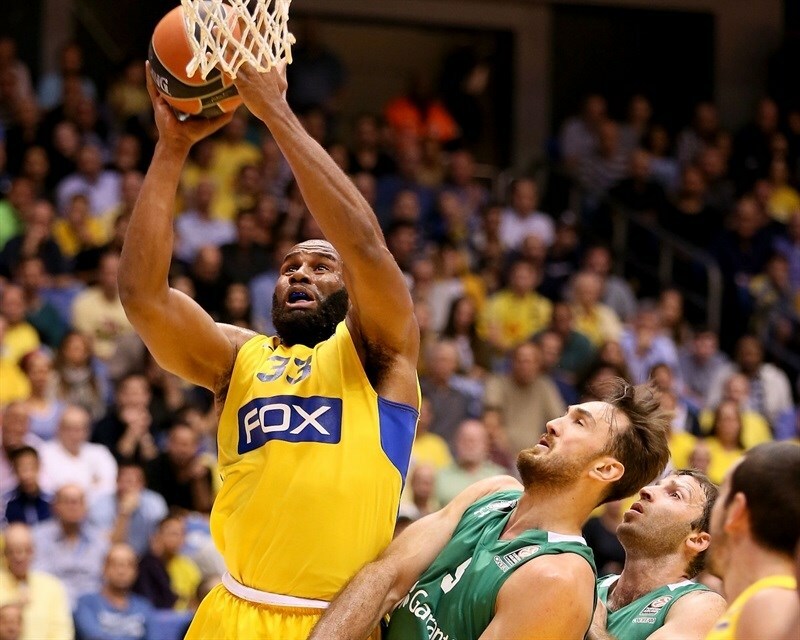 Trevor Mbakwe’s offensive rebounds extended a possession for Maccabi and led to a Smith free throw. 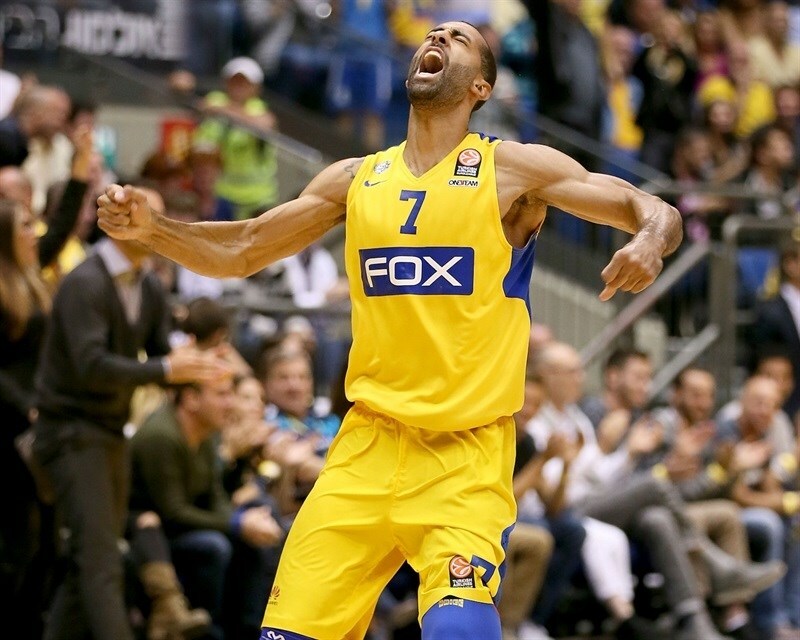 Farmar stepped up with a steal and layup that delighted the Maccabi faithful, however Mbakwe dropped a rebound out of bounds and Gordon made Maccabi pay with a layup. Slaughter rejected Smith as the hosts started to lose faith. 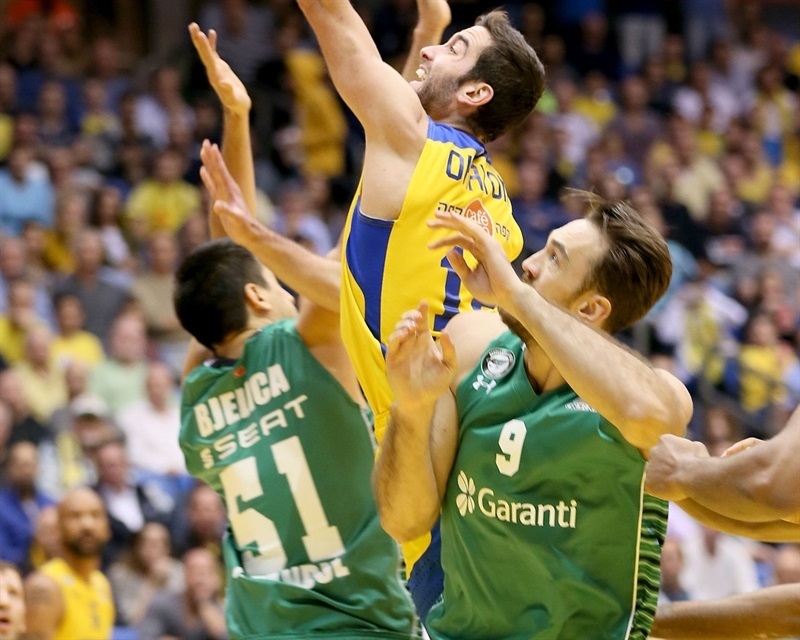 Rochestie scored again for Maccabi, but Markoishvili netted free throws at the other end. Bjelica split free throws and dunked on the break as the fans started to head for the exits. 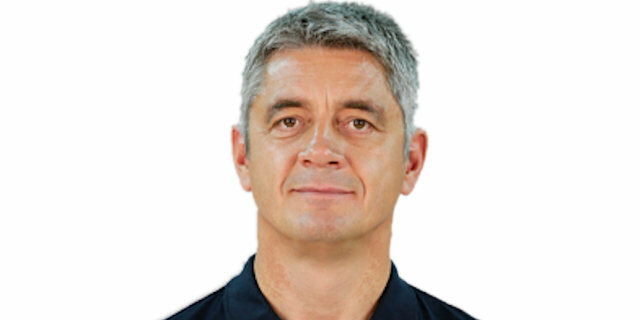 Smith’s triple changed little as Darusaffaka celebrated an important win. "We faced a good team that played well, while we weren't at our best, not on defense and not on offense." "Every game is a story unto itself. We fought from the beginning. We made a mistake in the second quarter, a little bit we rushed in offense and gave them an opportunity for the break. But second half we controlled totally the game. At one point we led by 15 and in the end we won away by , which is very good. " "It was a very disappointing game. We came in with a lot of determination to pay our fans back after recent events, but we weren't able to. Our situation now isn't a pleasant or easy one. The only thing left to do is keep our heads up and continue to work so we can win the next game." 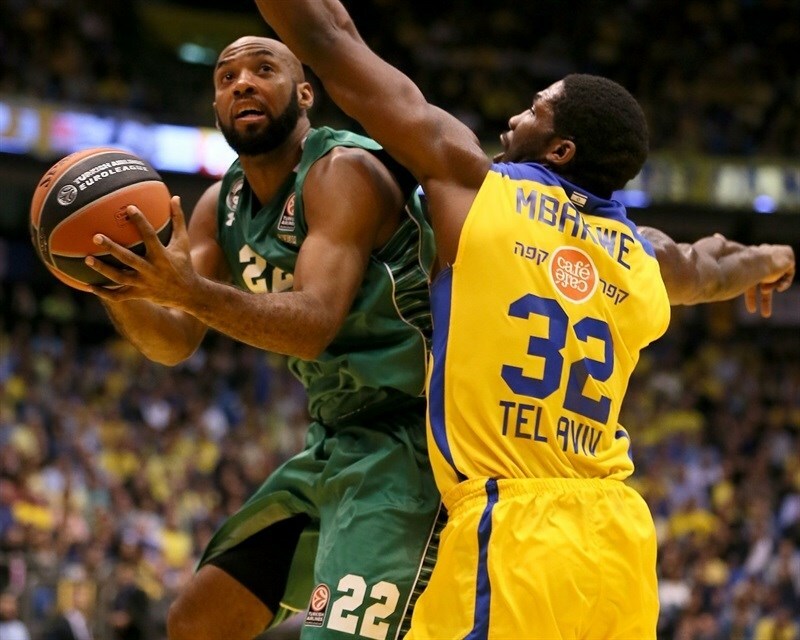 "We kind of had our back to the wall because our opponents beat Maccabi and it was a must-win game for us. I’m really happy to win this game because everybody knows how difficult it is to play Maccabi in front of this amazing crowd in Tel Aviv and definitely this game means a lot to us for our confidence and the team’s future."